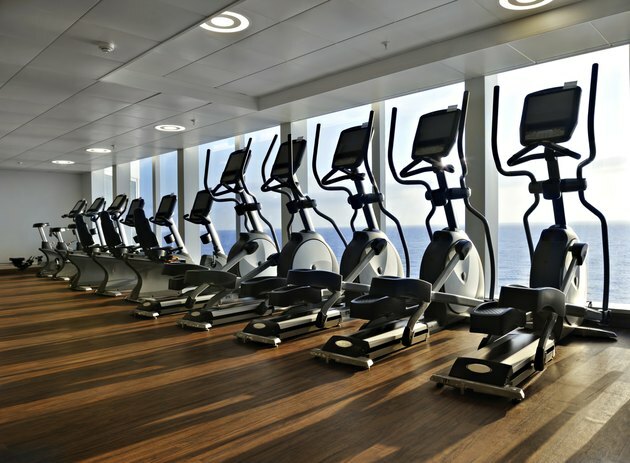 An elliptical machine, also known as a cross-trainer, is a piece of stationary workout equipment that incorporates several different cardiovascular exercises on one machine. On an elliptical trainer, you can simulate running and cross-country skiing. Many machines come with moving arm handles to provide an upper-body workout. According to an article in The Washington Post, an elliptical machine provides a no-impact workout and will not boost bone density or strengthen muscle. In a 2001 study sponsored by the American Council on Exercise, researchers at San Diego State University set out to discover the most efficient exercises for toned abdominals. The most successful moves for the midsection required no equipment. The best exercise for building abdominal muscle is resistance training. When you fatigue muscles through strength training, the muscle adapts to the resistance and helps it get stronger and bear even more weight. Low-impact elliptical machine do the opposite of fatiguing muscles. An elliptical trainer provides a cardiovascular workout that increases your heart rate and strengthens the heart muscle. The advantages of an elliptical machine include preventing impact on your knees, hips and back. Further, ellipticals with moving arms exercise the upper and low body at the same time. The primary purpose for using an elliptical machine is to burn calories and get a cardiovascular workout, also known as an aerobic workout. Continuous, endurance exercise from an elliptical machine engages large muscles in the arms and legs and helps the heart work more efficiently while exercising and at rest. Regular cardio activity increases your fitness level and helps prevent heart disease. Regular aerobic activity also controls cholesterol levels in the blood and can prevent the onset of diabetes and obesity. The American Heart Association reports that to gain the most health benefits for your heart, lungs and circulation, you should perform 30 minutes of moderate to vigorously intense aerobic activity most days of the week. The most beneficial aerobic exercises are brisk walking, jogging, running and rowing – all moves that are emulated on an elliptical trainer. The American College of Sports Medicine suggests that healthy adults under the age of 65 also need to do eight to 10 strength-training exercises twice a week. There are several exercises for your abs that are effective such as the Bicycle Maneuver, Captains Chair and Reverse Crunch, according to the American Council on Exercise. For the best results, do abdominal exercises for five minutes a day to improve your posture, alleviate lower back pain and strengthen your core.